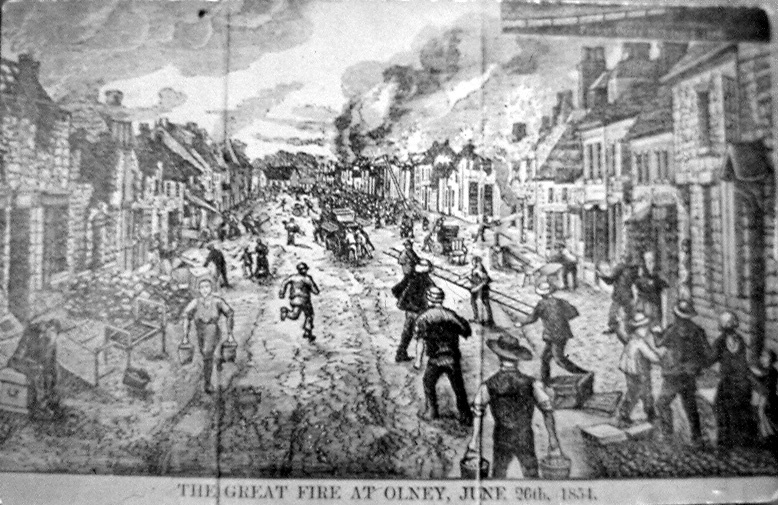 On Monday 26th June 1854 Olney suffered a calamitous fire. The fire is believed to have started on the western side of the High Street, to the south of what now is the Olney Centre. The fire was so noteworthy that it was reported in full in The Illustrated London News on 8th July 1854. The illustration below is reproduced from The London Illustrated News and is included in many almanacks and books associated with the history of Olney. The narrative accompanying the illustration is less well known and is reproduced in full below. It provides an insight into the severe poverty that prevailed in Olney at that time. The Olney & District Historical Society is indebted to local historian, Alan Richardson, who kindly provided the material for this article. Illustration from the London Illustrated News dated 8th July 1854. The rural town of Olney, in Buckinghamshire – a place endeared to us by its association with the poet Cowper and his friends – has just been visited by a destructive and calamitous conflagration. 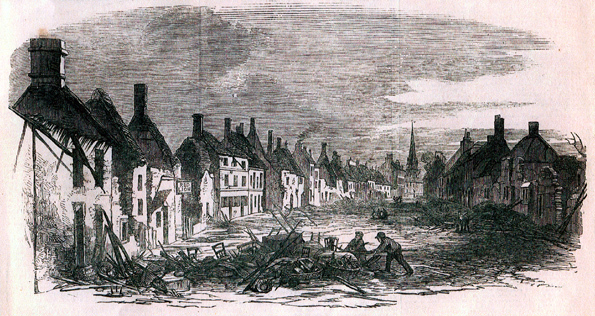 A sort of fatality appears to attend the town; for the Northampton Herald report of the catastrophe commences by observing: – “Often as during the last two or three years we have had to record the destruction of life and property by fire in this little town, we have never had occasion to detail so fearful a conflagration, as to property, as that which occurred on Monday” the 26th ult. It appears that about two o’clock in the afternoon the thatch of a small wash-house was discovered to be on fire, at about the middle of the High-street, on the western side. The flames almost instantaneously communicated to the premises of a dyer, next door; and, before any efficient alarm could be given, the premises of a blacksmith, considerably lower down on the opposite side of the street, were set on fire by the boisterous wind carrying flakes of burning thatch in a north easterly direction. From house to house the burning masses continued to be borne by the wind, till several dwellings and outbuildings, barns, and two or three farm-yards, were enveloped in flames. The three parish engines, aided by two from Newport Pagnell, and one from ?Yardley Hastings, all worked by able and willing hands, did their utmost, but could not be ubiquitous; and the fire made its way from ridge to ridge, till some twenty or thirty houses on the eastern side and some ten or twelve opposite, together with a considerable number of buildings in the rear, outbuildings, and a large quantity of hay, beans &c., were destroyed, or rendered useless; one-sixth of the whole number of houses in the town being burnt down or seriously damaged. The loss is roughly estimated at between £9000 and £10,000. The insurance extends but to about £3000; and the distress and ruin of the poorer tenants, many of whom lost every article they possessed, except the clothes they escaped in, and is truly afflicting. A number of women and children were housed temporarily in the National School and other places, where they were lodged and fed; and others found a home in such cottages as were empty. Many of the poor, highly to their credit, opened their little abodes to their destitute neighbours; but there still remain a large number of persons homeless, it being reckoned that 300 persons have been driven out by this fearful desolation. It is a consolation to know that no lives were lost. The fire was accidental: it broke out as nearly as possible on the same spot as a still more extensive fire in 1787. A benevolent Correspondent has collected a few additional facts, tending to show the calamitous circumstances of this visitation. Many persons, it appears, considering their houses in danger removed their goods and clothes to places supposed to be safe, at a distance from the flames; but, in several instances they were destroyed before the owners had the slightest idea that they were in danger a second time; and in many places where ladders had been set against houses for the removal of goods, those upon them had scarcely time to get down before they were consumed; and every scrap of wood, even the wood covering of wells, are charred by the intense heat of the flames. The ruins are calcined; and the walls, being built of limestone, are in many cases reduced to lime. The number of houses destroyed is 55, and 25 others damaged – altogether, 80. The greatest sufferers are those who derive a scanty living by carrying on a small trade with the very poor; and, from both classes being burnt out, the former must, in addition to the loss of their property, add the loss of their debts. Another class of sufferers are those who, by dint of hard savings, have built cottages in the gardens, which are attached to all the houses in Olney; and, although insured, the amount in all cases is inadequate. The most praiseworthy efforts are being made by all classes of the inhabitants to relieve, the wants of the distressed, by making various articles of clothing, &c., to meet immediate necessities; and already the pressing wants of food and clothing have been provided for. A committee of gentlemen, with the Vicar as chairman, together with a sub-committee of ladies, are actively engaged in carrying out all remedial measures that they are enabled to do by means of the contributions placed in their hands for the purpose. These at present amount to nearly £300; but nothing short of a very liberal contribution can materially assist the sufferers. The place, as sketched by our Artist, presents a fearful picture of desolation; solitary chimneys and gables, charred roofs and window-frames being all that remain of many a rural homestead and abode of smiling content such as can be nowhere seen so abundantly as in England; yet the calamity at Olney is borne with patience and resignation such as must excite the sympathy of every Christian community.